Voting selfies violate the sanctity of the ballot box. That's a good thing. 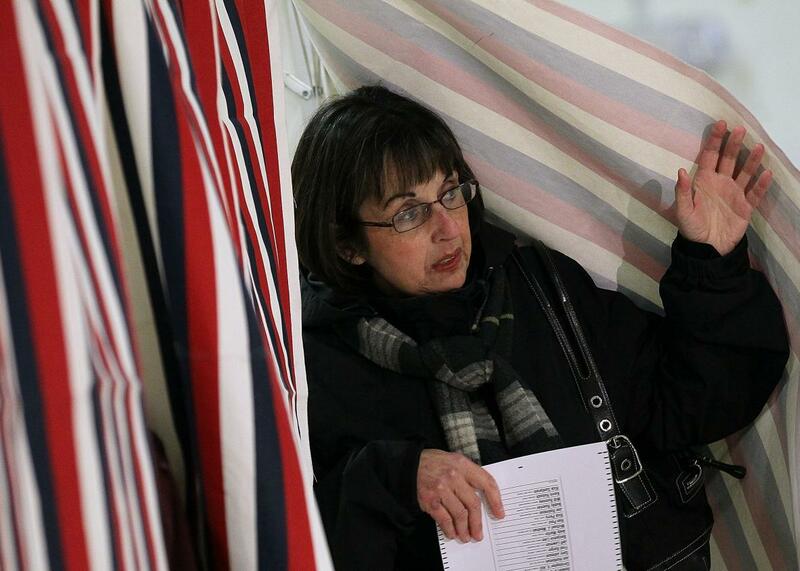 A voter leaves the polling booth after filling out her ballot for the New Hampshire GOP primary on Jan. 10, 2012. Prescient and wise though he was on certain matters, the famously reclusive White could not have foreseen the appeal of selfies and the slavish devotion of those who snap them, nor their place in debates about suffrage. Selfie takers may be radiant, but they’re not terribly humble and can be a bit piggish. The advent of the selfie ballot may be causing a spiritual crisis for those who worship democracy. To produce a ballot-box selfie, complete the following steps: Take a photo of yourself with your marked ballot. Use flash only as needed, i.e., when your district’s booth is relegated to the dark corner of the high school gym. Collect your “I voted” sticker, and Photoshop image thereof into original photo. (This part is optional but encouraged.) Post to social media platform of choice. Rocking of vote complete. Watch the likes roll in—that is, of course, as long as you’re not in Indiana. In 2014, New Hampshire updated a decades-old election law to extend the general ban on a voter sharing her marked ballot to specifically prohibit social distribution. The rationale? Selfies and the information they contain could lead to coercion and vote buying. Boss Tweed political-machine types and corporate overlords with a cause, the argument goes, will demand voting booth selfies as proof that smartphone-wielding employees are toeing the party and company line. The increasing political influence of corporations is real and a source of concern. The prospect of a resurgence of vote-buying by powerful interests is scary. It is also already illegal. The Indiana and New Hampshire legislatures’ motivations in banning the ballot selfie may or may not be noble. Underlying the laws is the notion of a pure voting experience unsullied by external forces, a celebration of political expression, of participation, of the power of the one, of the power of the many. Voting is the cornerstone of our democracy, so this is appealing stuff. I admire the instinct to protect the vote. Despite whiffs of paternalism, it’s a welcome balancing influence to the unfailing belief in transparency as a cure to all political woes. But the doctrinaire approach—protect the sanctity the booth—misses an important point: It’s hard to celebrate by yourself. One need look no further than the Iowa caucuses for proof that politics is a team sport. Democracy (when it’s functioning as intended) is a religion open to all. So it is with the selfie. Selfies are meant to be shared for all to see and comment upon. And I expect the tweeting masses won’t give up on the right to frame without a fight, or, at the very least, a rousing debate.